Nell Jean Call passed away at New Hope Assisted Living Tuesday, June 13, 2017, on her Wedding Anniversary surrounded by her loving family. A beautiful singing voice has been added to God’s choir; as many of you recall her yearly birthday song calls to your home. She had a love of life and was very active in Pit and Balcony, Germania Club, roller skating, ice skating, and taking her children to State Park swimming. She and Tom, Sr. were involved in their children’s sports, loved traveling, and very active within the Roman Catholic Church. Nell Jean retired from the Diocese of Saginaw. Her children attended Catholic Schools. She was an avid animal lover. She was much loved by everyone who knew her and was known to have helped many of those in need, including the Lakota Sioux of St. Labre School in Montana. Nell Jean was of French/Metis ancestry, whose family came to Saginaw from Yamaska, Quebec in 1863. 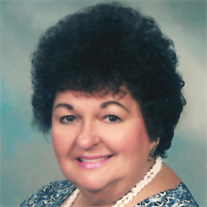 Nell Jean was predeceased by her beloved husband, Tom, Sr. on May 9, 2015. She also was predeceased by her beloved parents, Nellie Marie and Joseph D. LaFleur, her sister, Louise Wagner, dearly loved furry companions, Tuffy and Harley, and many other relatives and close friends. Left to grieve and cherish her memory are her three sons and spouses: Thomas Call, Jr. (Susie), Lanny Call (Bonnie), and Joseph Call (Chris). She also leaves behind her very much loved sisters: Dorothy Griffore (102) and Marcelyn Vanderburg (98). Her grandchildren, great grandchildren, great great grandchildren, nieces and nephews and countless friends will miss her gentle smiling heart. The family would like to extend a special thank you to Margo and the other Sisters of Missiondale, Fr. Pete, and New Hope staff for their loving concern and care. Prayers are appreciated. Any donations should be in Nell Jean Call’s name to Amazing Grace Animal Rescue 3315 Freeland Road, Saginaw, MI 48604. A Funeral Mass will take place at 11:00 am on Monday, June 26, 2017 at Holy Spirit Catholic Church, 1035 N. River Rd. VISITATION: Friends are welcome to visit with the family at the church on Monday from 10:00 a.m. until the time of Mass. Vou avez touché nos coeur.